Yesterday, President Trump threatened to impose penalties on China for alleged abuse of intellectual property right rules. Below is the context behind way claims of abuses are likely to increase in the future. This suggests that China and the US are on a collision course over trade, with major negative implications for the global economy. Global petrochemicals trade flows could also be reshaped as the US loses out in China. The number of babies born in China during the One Child Policy was 400 million lower than would otherwise have been the case, according to Chinese government research. 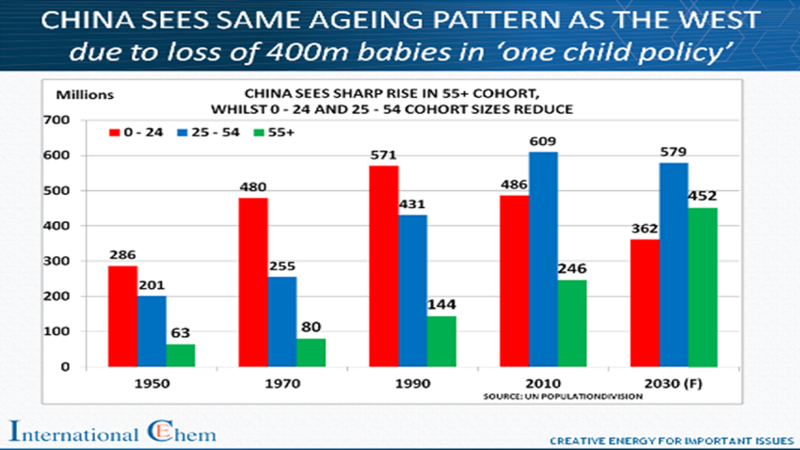 For this reason, China is experiencing the same pattern of population ageing as in the West. In coastal rich China, rising wage costs because of population ageing mean that lower-value manufacturing is no longer competitive. In these provinces and regions, China has fallen into a middle-income trap. It has to raise the value of its manufacturing and service industries by enough to escape this trap, otherwise economic history suggests that its economy will stagnate. If it hadn’t been for the loss of 400 million babies, China would have had many more years before its demographic pattern followed that of the West. 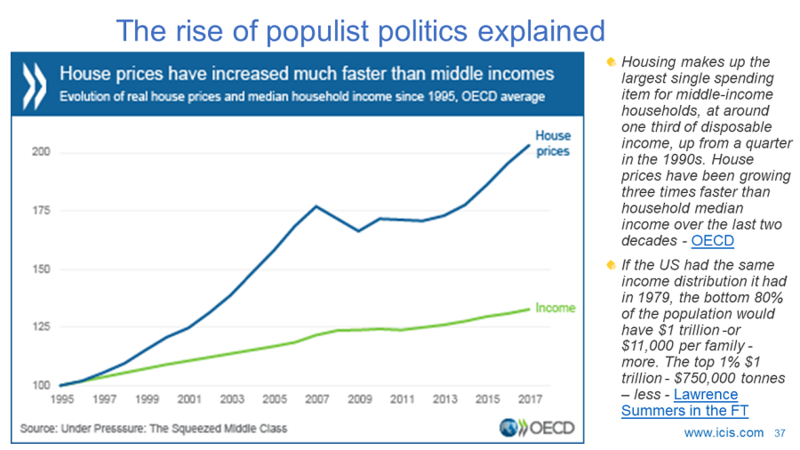 Why this time would have been useful is that 500 million Chinese citizens – 36% of the population – still live on less than $5.50 a day, according to the World Bank. China is thus at risk of becoming an old country before it becomes a rich country: Its poverty level raises danger that it will have insufficient tax revenues to pay for rapidly increasing healthcare and pension costs. Tax revenues and employment would also suffer from failure to escape the middle-income trap. Failure would consist of a major drift in lower-value manufacturing to cheaper countries, with higher-value manufacturing and services falling short of filling the economic hole. Over the years, I have heard many examples from overseas chemicals industry executives of how these abuses apparently work. For instance, a foreign company is required to lodge its technology blueprints with a local government. The blueprints end up in the hands of a local competitor which sets up rival manufacturing using that same technology. It is claimed by the US that Chinese abuses across all industries cost the US $600 billion a year. This would amount to trillions of dollars over several decades. Pressure is building on China to obtain more intellectual property because of its middle-income trap. 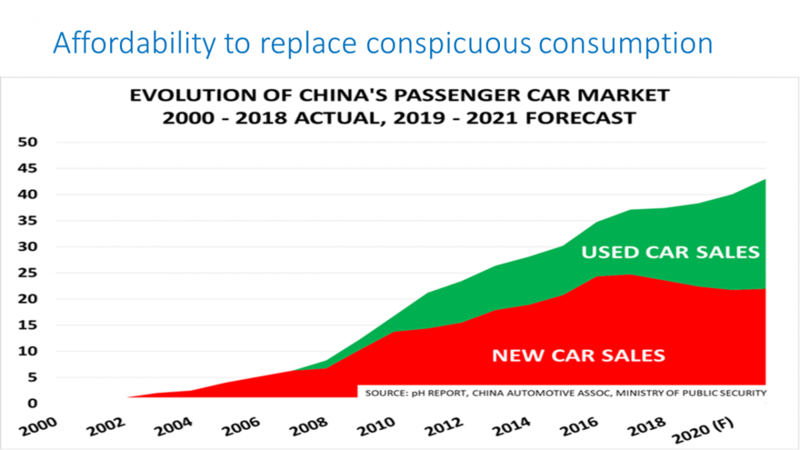 As foreign competitors lose out because of China moving up the value chain, this might trigger many more claims – justified or not – of further intellectual property abuses. Meanwhile, warning signs are flashing red over the US-China trading relationship. This follows President Trump’s disclosure yesterday that the US is considering clamping down on Chinese investments in the US and imposing new tariffs on a broad range of Chinese imports. This would punish Beijing for its alleged theft of intellectual property, according to Bloomberg. The new measures could be introduced during the next few weeks. Yesterday also saw Gary Cohn step down as head of President Trump’s National Economic Council. His resignation is said by some commentators to be the result of his failure to persuade the president not to levy heavy new US imports tariffs on steel and aluminium tariffs. Cohn is a free trader. This suggests that the influence of protectionists within the White House is on the rise. I have no idea to what extent China has broken the rules on intellectual property rights. What does seem clear to me, though, is that it has no choice but to obtain more manufacturing and service sector knowhow. 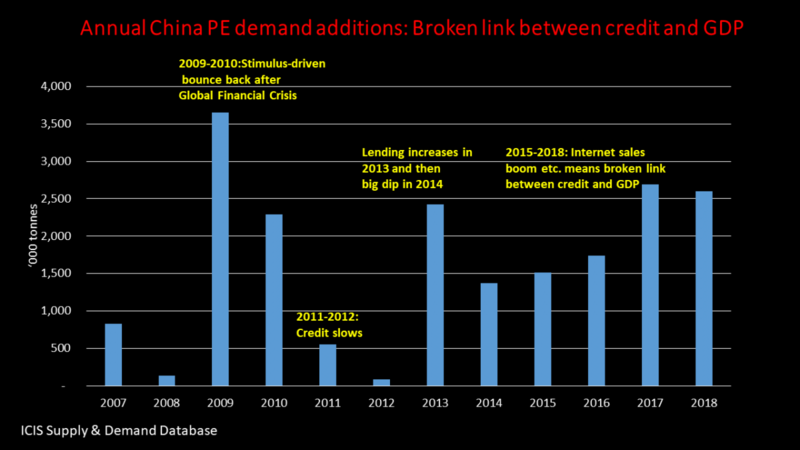 The alternative would be economic stagnation – and that would be bad news both for China and the rest of the world. The US and China therefore look as if they are on a collision course that could first of all bring the “synchronised global economic recovery” to an end. The phrase is inverted commas because I have never believed it has any real, solid foundation. The global economy has underlying, fundamental weaknesses that policy makers have failed to address. A global trade war is just one of many events that could expose these weaknesses. China divides other countries into friends and adversaries, with its friends inside its Belt and Road Initiative (BRI) region. Adversaries will include the US. Wherever possible, China imports the raw materials it needs from BRI member countries at the expense of other countries and regions. This reshapes global petrochemicals trade flows. Meanwhile, foreign direct investment opportunities in China will be largely limited to BRI members. The BRI is world’s biggest free trade zone, accounting for some 40% of the global population. Meanwhile, the US becomes a more closed economy. 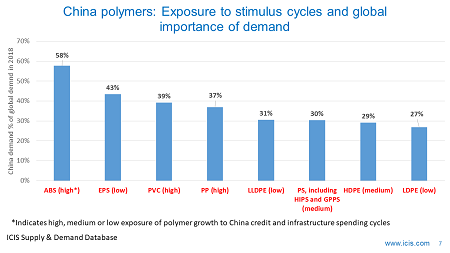 As I said, rising trade tensions between the US and China have the potential to redraw global petrochemicals trade flows with the US most obviously vulnerable on polyethylene (PE). 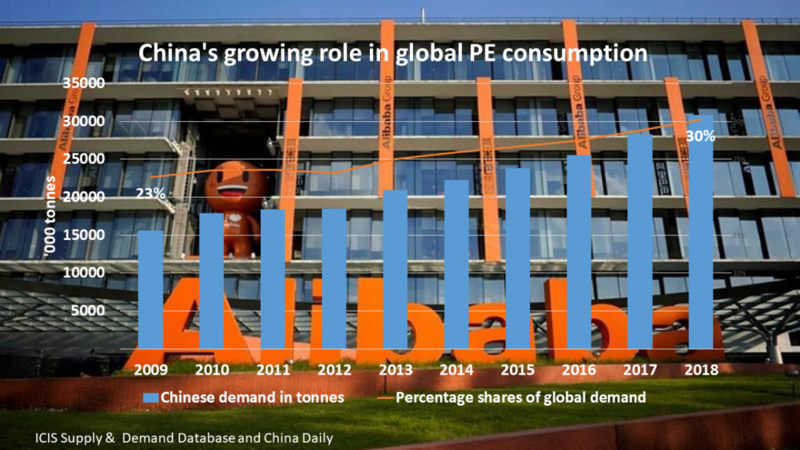 This is because of the sharp rise in US PE capacity. But PE is just one many products that could be affected. Another is styrene. 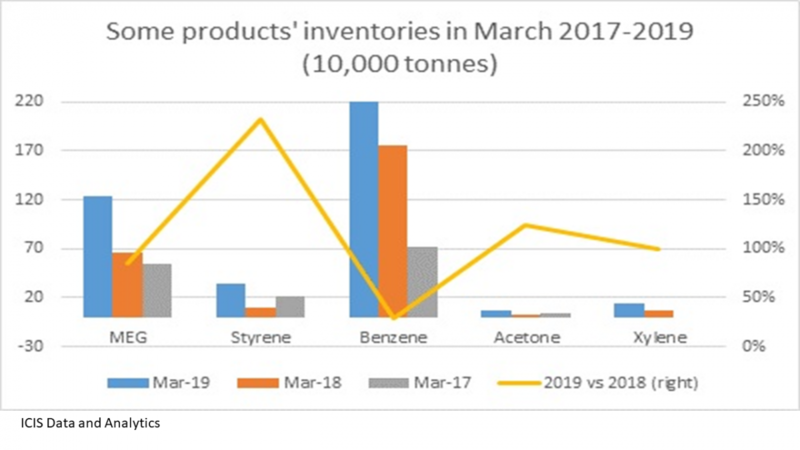 The ICIS Supply & Demand Database base case view is that China’s styrene imports will edge down from 3.1m tonnes in 2018 to 2.7m tonnes in 2025 on an increase in local capacity. But China will remain by far the most import market by volume in the world. China could choose to source most, if not all, of its future imports from fellow BRI member countries at the expense of the US. The whole of the Middle East is in the BRI, with the Middle East in a good position to raise trade with China because of its low cost ethylene production (styrene is made from ethylene and benzene). In 2017, the US exported 305,706 tonnes of styrene to China. This was 10% of China’s total imports. This represented 24% of total US styrene exports of 1.3m tonnes. The US, like the Middle East, has access to very low cost ethylene because of the shale gas revolution. It thus seems likely that rather than cut back production if the US lost access to the China market, it would raise exports to other countries and regions. This would push down margins in alternative markets at the expense of the local higher cost producers. 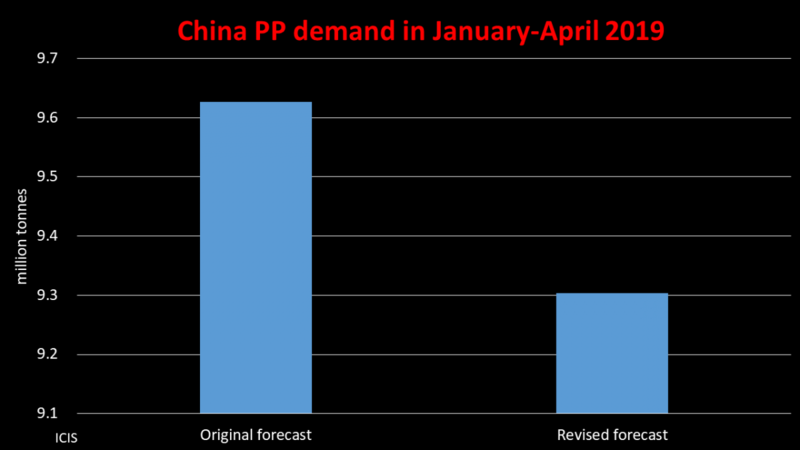 These producers might successfully petition their governments for new import duties on US styrene. 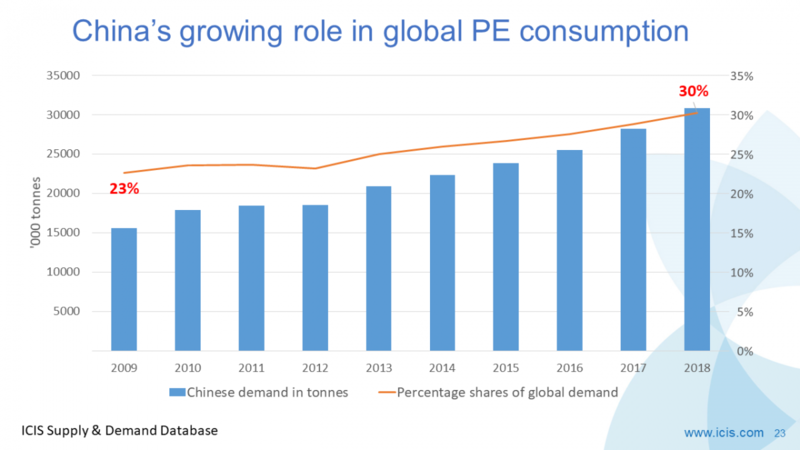 The styrene industry might end up as an example of the destructive power of a global trade war where all sides get trapped into a downward cycle of increasing protectionism.